Newly revealed security-related transportation documents for the Atlantic Yards arena indicate that, contrary to previous suggestions that no bollards would be needed, 206 such bollards--178 fixed, 28 removable, one foot in diameter--would be installed at the facility's perimeter. The above graphic, excerpted from a New York City Department of Transportation (DOT) document (below), shows the bollards and tree pits on the Atlantic Avenue sidewalk bordering the north side of arena. It also indicates that the arena's "overhead canopy" essentially meets the property line, which is 11'8" (11.5 ft) from the street. 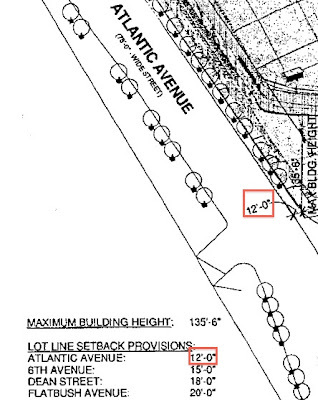 Further complicating the situation, the new documents reveal that, in the strip of Atlantic Avenue sidewalk just east of the arena, the sidewalk is 9.5 ft wide. Given typical buffer zone subtractions, the effective width of the sidewalk would be 5.5 feet, much less than disclosed in the environmental review and likely a bottleneck for arena-bound pedestrians, as noted by Atlantic Yards Watch. The DOT is accepting comments on the plans through Thursday, August 25 by email to Emma Berenblit at eberenblit@dot.nyc.gov. 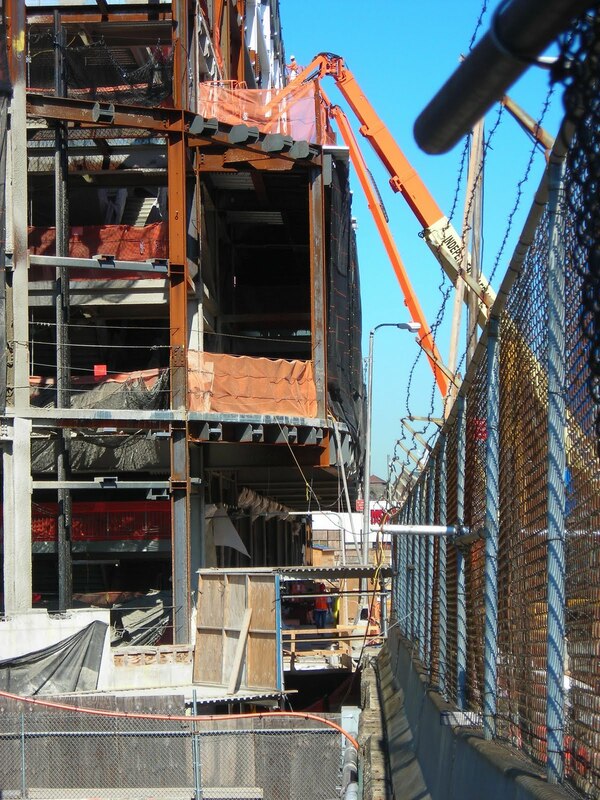 As shown in the photo (right) taken 2/24/11 by Tracy Collins, looking west from the corner of Sixth Avenue and Atlantic Avenue, the "canopy" structure extends nearly to the sidewalk, which is 12 feet wide. That's why the construction perimeter has been extended out to encompass the first eastbound lane on Atlantic Avenue. Given that 20 feet is already pretty close--in 20-foot distance (also reported as 25 feet) is tight enough to close streets outside the Prudential Center--how can this arena be built even closer? Answer: It all depends on the meaning of street. 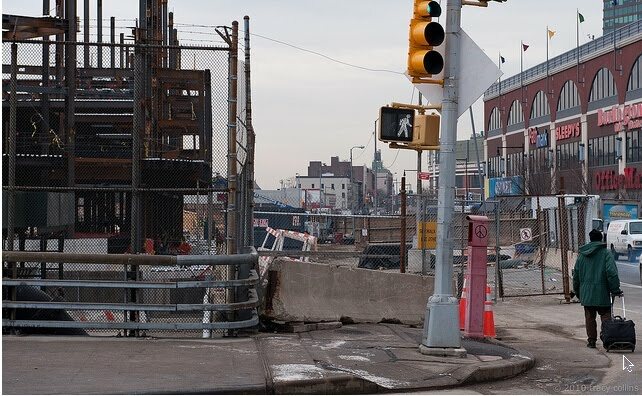 "Sidewalk widths on Atlantic and Flatbush next to the arena will be 20’, and there are no plans to close streets next to the arena," Empire State Development Corporation spokeswoman Elizabeth Mitchell told me. 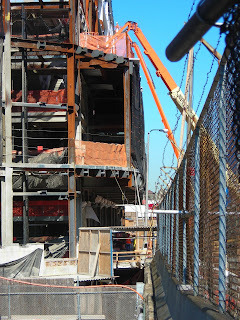 However, that doesn't mean the building itself would be consistently 20 feet from the street, as the photo (left) that I took 7/5/11 further confirmss. In fact, what did not surface four years ago when the security issue first arose, the Design Guidelines (p. 23) allow for sidewalk widening by extending the sidewalk under the arena back into the lot, not by extending the sidewalk out into the street. ii. No portion of any Building shall be located within the sidewalk widening below a height of fifteen feet above the adjoining curb level, except that canopies may be located in such area. In other words, as long as the building is at least 15 feet above the curb, it can extend over the sidewalk widening. Indeed, that seems to be hinted in the Arena Schematic Diagram (below, and excerpted in graphic at right) submitted to the New York City Department of Buildings by the arena architects. The only way to achieve a 20-foot sidewalk is to go under the building. The bollard were not mentioned in the Design Guidelines. Note that they are considerably smaller than the coffin-like bollards outside the Long Island Rail Road terminal. Would Brooklyn face a situation akin to Newark, where streets surrounding the Prudential Center are closed on game days? The ESDC said "there are no plans to close streets," which does leave some wiggle room. [Forest City Ratner spokesman] Mr. [Loren] Riegelhaupt confirmed that this meant that at all points, the arena would be set back at least 20 feet from the street. ...That is the same distance as the Newark arena is from its neighboring streets. So what’s different about the Atlantic Yards arena? That, Mr. Riegelhaupt said, is a security question, to be directed to the Police Department. The Police Department has said that its policy is not to comment on such matters. Riegelhaupt's answer may have been narrowly true--at all ground level points, the arena would be set back at least 20 feet from the street, but the question should be: what about when the arena is less than 20 feet from the street above ground level? Forest City Ratner and the New York Police Department have surely had many high-level discussions on security. But shouldn't they explain, at least in outline, why the Brooklyn design is safer than the one in Newark? Or make the case that Newark is overreacting? After all, plans have already changed. A NYPD spokesman told the 11/30/07 Brooklyn Daily Eagle that "the department doesn’t foresee any street or land closures, sidewalk widening around the arena or the instillation of bollards." 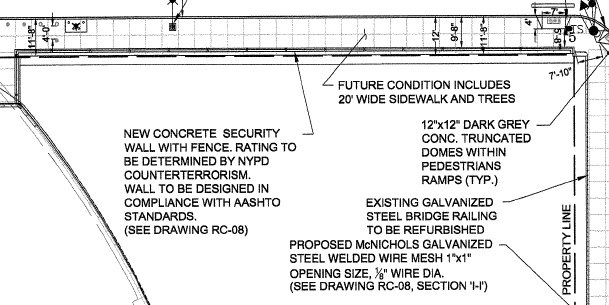 The graphic above shows the sidewalk along Atlantic Avenue next to the site for Building 4, just west of Sixth Avenue. Note that the new concrete security wall with fence seems to extend past the dotted property line, thus creating a width of 9. '8", or 9.5 feet. Subtract 4 feet and you've got an effective width of 5.5 feet, as noted by Atlantic Yards Watch. Also note that "future condition includes 20' sidewalk and trees--presumably not until a building is constructed. Note that the arena is not fully set back from the street line, just at ground level. The south sidewalk along Atlantic Avenue would be set back between Flatbush Avenue and Fort Greene Place to accommodate creation of an 8-foot-wide lay-by lane adjacent to the arena block. Three eastbound through-lanes would be provided along this block along with four westbound lanes (three through and one right-turn-only). East of Fort Greene Place, Atlantic Avenue would be reconfigured to operate with three travel lanes and a single 10-foot-wide parking lane in each direction, plus an 8- to 15-foot-wide raised median. (The existing 21-foot-wide double parking lane along the north curb adjacent to the Atlantic Center mall would be reduced in width.) The eastbound and westbound left-turn bays at 6th Avenue/South Portland Avenue would be maintained. Atlantic Avenue, which borders the project site on the north, is an east-west arterial that provides access to the BQE at its western end. West of 4th Avenue, it is typically 60 feet in width and operates with two travel lanes plus a parking lane in each direction. Curbside parking is restricted at several locations during peak periods. Atlantic Avenue widens to approximately 70 feet in width between 4th and Flatbush Avenues, and to approximately 75 feet in width between Flatbush and 5th Avenues, where it is striped for four westbound lanes (two of which are right-turn-only lanes) and two moving lanes eastbound. Between 5th and 6th Avenues, a double-width parking lane is provided along the westbound curb adjacent to the Atlantic Center shopping mall. East of 6th Avenue, Atlantic Avenue further widens to approximately 95 feet in width and is typically striped for three travel lanes in each direction with exclusive left-turn bays. How wide is sidewalk now? 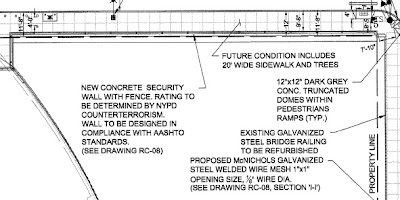 Chapter 13, Transit and Pedestrians of the FEIS, embedded below, indicates that existing sidewalk widths along Atlantic Avenue adjacent to the project site are typically 10 to 12 feet. 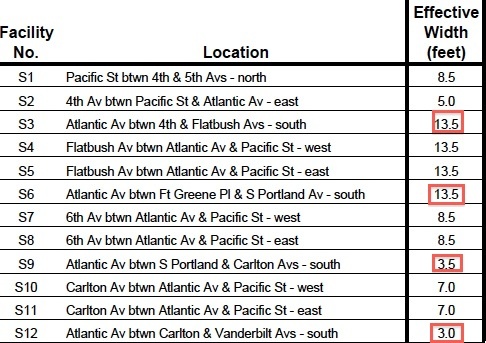 A table from Chapter 13 suggests, however, that the effective width along the south side of Atlantic Avenue bordering the arena, between Fort Greene Place (the continuation of closed Fifth Avenue) and South Portland Avenue (the continuation of Sixth Avenue), is currently just 7.5 feet, 4.5 feet less than the sidewalk width. As shown in Figure 12-5 in Chapter 12, “Traffic and Parking,” the arena and other proposed buildings would be set back to provide for 20-foot-wide sidewalks along Atlantic Avenue compared with the existing 10- to 12-foot-wide sidewalks. That's a bit of a fudge. The arena would not be fully set back. The arena would be set back only at street level. The expansion is reflected in the table below from Chapter 13, which promised an effective width of 13.5 feet on Atlantic Avenue bordering the arena, between Fort Greene Place and South Portland Avenue. However, as schematics published here suggest, that's a pipe dream. Also note an effective width of just 3.5 feet on Atlantic Avenue east of the arena, between South Portland and Carlton Avenues. That ensures that those using the surface parking lot--between Carlton and Vanderbilt avenues and Dean and Pacific streets--would walk west along residential Dean and Pacific streets rather than the sidewalk bordering broad Atlantic Avenue. Figure 12-5a from the FEIS, embedded below and excerpted directly below, describes proposed changes to the street system around the arena block. 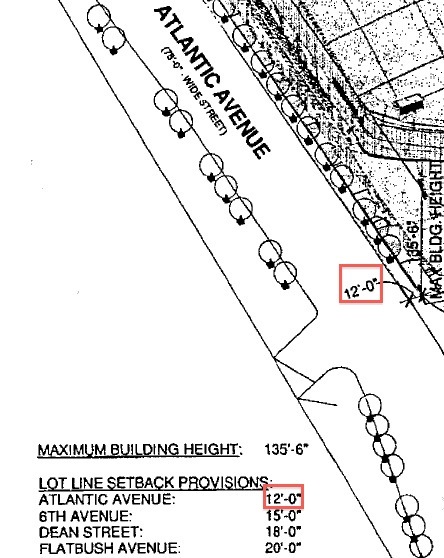 As the highlight in red shows, the document revealed that the Atlantic Avenue sidewalk would remain 12 feet wide at the lot line. If the sidewalk is going to be expanded to 20 feet, that expansion would have to be accomplished, as described, by going away from the street, not toward it. Is this, and the modular parking structure, stuff that will be addressed in a revised EIS? Security is not part of the EIS, as court decisions have shown. But it's not clear that the state will do a Supplemental EIS, as a judge has ordered. The state may appeal that decision.